It was a rejection not only of the anti-people economic policies of the Modi government but also the Sangh Parivar’s vision where mandirs and statues are more important than people. One of the slogans that kept rending the air while tens of thousands of farmers marched towards Parliament on November 30, 2018 was ‘Ayodhya nahin, karz maafi chahiye’ (Not Ayodhya, we want debt write off). What the farmers meant was that – we are not fooled by all this talk of building a Ram Temple in Ayodhya, we are not concerned with it, what we want is that the stupendous debt on our backs should be done away with. This perhaps symbolised the great significance of the farmers’ march under the aegis of a joint front of 208 organisations. The rejection was not just of the economic policies of the Modi government – that had led to the severe indebtedness among farmers and thousands of suicides – but also of the incendiary and unscrupulous game being played by the Bharatiya Janata Party (BJP) and associates of the Sangh Parivar in dividing people on the grounds of religion, pretending to be messiahs of the Hindu community and targeting the minorities with hateful poison and bloodshed. The farmers’ march and its emotions had thus rejected the twin wheels on which Modi and his party have been riding ever since the heady days of 2013 when he emerged as a critic of the Congress-led United Progressive Alliance government. The twin wheels of Modi’s chariot – a neoliberal economic policy and a Hindu supremacist ideology – have devastated the country in four and a half years of their unbridled rule. Mainstream media, with its obsession with political personalities and electoral arithmetic, totally failed to see the significance of this. Media reports were dominated by political leaders holding hands and speculation about what effect this would have on the 2019 general elections. This was important, but it was a case of missing the wood for the trees. Political leaders were there because farmers make up the biggest class or section of people in the country, numbering over 12 crore. If you add the nearly 15 crore agricultural labourers, the farming community makes up a mind boggling 27 crore persons, over 54% of India’s workforce. This vast number of people have been in ferment for a long time but in the past few years this ferment has taken on a different shape. Starting with the ill-fated attempt by Modi in 2015 to bring in a law for grabbing farmers’ land, which had to be withdrawn after widespread protests, the farmers have been on the warpath almost continuously. The key issues have been low prices for produce and debt. The demands have been to implement the Swaminathan Commission recommendation of fixing the minimum support price at 50% over the full cost of production, called C2 in government parlance, and a complete debt waiver, including of debt owed to private money lenders. In addition, demands for land reforms, better wages for agricultural labourers, better irrigation, crop damage compensation etc. have also been at the forefront. Over 13 states have seen massive agitations by farmers on these demands. Delhi itself has witnessed a three-day Kisan Sansad (Farmers’ Parliament) in 2017, a Worker-Farmer Joint Rally in September 2018, and then this March to Parliament on 29-30 November 2018. A significant development of recent months has been the merging of two powerful streams of struggles – farmers and workers. Led by all central trade unions, except the BJP affiliated one, industrial workers have been valiantly fighting against wage freeze, dilution of labour laws, contractualisation, privatisation of public sector, etc. with two major country-wide strikes in 2015 and 2017 and a historic march to Parliament in 2016. Trade unions supported the Kisan March too. The coming together of these two fighting classes of the country, their common programmes of protest, and the new sense of solidarity which spans the rural-urban divides has created a huge groundswell of opinion against the Modi government and its disastrous economic policies. The March on November 30, was thus not a flash in the pan. It was another step in the ever-widening struggle of working people against a ruling dispensation that has systematically ignored them, tried to fool them with fraudulent statistics and lies, and has all the time been openly helping the super-rich industrialists to fill their coffers. 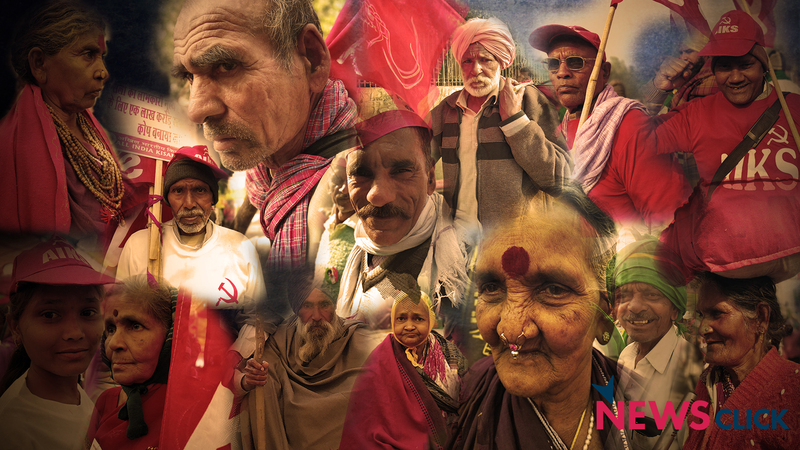 The participation of leaders of various non-Left parties in the Kisan March was a recognition of the mood of the working people and their fighting spirit. They realise that a massive force is flexing its muscles and that it will have an impact on electoral politics too. Many of them are actually committed to similar kind of neoliberal dogmas that have pauperised the working people of the country under Modi. But political compulsions are making them side with the fighting people. So, what about the BJP/RSS strategy of using religious sentiments to polarise people and gain electoral advantage? The threat of this is ever-present especially if the BJP/RSS feels besieged, as it does now. That is why the attempts to whip up sentiments on the Ayodhya issue with plans for meetings across the country to demand building of Ram Temple. But, as the Kisan March exemplified, the struggle of workers and peasants is well conscious of this dangerous conspiracy and at each step, with each slogan, it is rejecting it and preparing the people for piercing through the opportunistic game of Modi and his associates. With this momentum, and resolve, and with the likely setback to BJP in the ongoing Assembly elections, the stage is steadily being set up for ousting the ruling Modi government. Only then can the demands of workers and farmers be truly met.